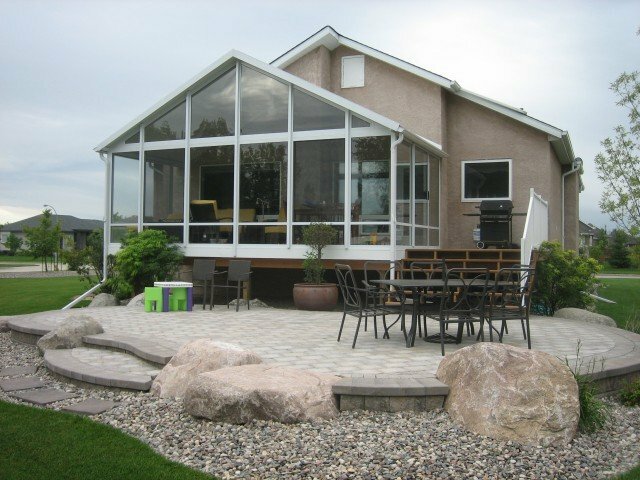 Relax in the splendor of the great outdoors, without pesky insects, wind, rain, or snow in a 3 Season Glastar Sunroom. Our extremely versatile system utilizes modular components, our unique “floatation” system, along with various combinations of glass, screen, and maintenance free aluminum to create a custom designed room that is both functional and luxurious. A bright and panoramic view is created from the large 3’ and 4’ wide panels. Constructed of aluminum, screen, and glass the Glastar does not absorb odors or moisture (unlike wood construction) and as a result you feel as if you are always outdoors. Many of our sunroom design layouts feature angled wall sections - that can soften the shape and give it a design feature. The 3 Season Glastar Sunroom has been designed for use typically from March thru to November. The 3 Season Sunroom can be designed with a flat, sloped, or gable/peaked style roof line to match existing building structures. Available colors for the sunroom framing are white, ivory and brown.